When flying to Orlando for your Disney World Vacation, one of the important details to figure out is how are you going to get from the Orlando Airport to the Walt Disney World Resort. Rent a Car - This is an expensive option, especially if you planned on staying on the Disney Property for the duration of the trip. You will find that you are paying for the car to sit idle most of your trip and it is not really necessary. Take the Mears Shuttle - This option could get very expensive as you will have to pay per person. Any group more than two makes this an expensive option. Rent a Towncar - We like this option as there are several reputable firms in Orlando that do a nice job of shuttling people to and from the Airport to their Disney Resorts. All of the these options cost real money and become an expense that you have to include as part of your trip budgeting process. Then Disney World introduced the Magical Express concept. This is a wonderful idea that eliminates a big expense for those who want to fly to get to Disney World. Disney benefits by creating a more captive audience for the duration of their vacation. Once you make your airline reservations, you call Disney World and have them add this information to your resort reservation. 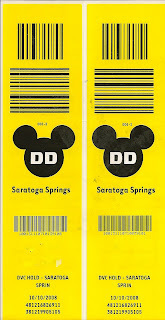 About 4-6 weeks prior to your trip you will receive a packet in the mail that includes an information booklet with your Magical Express tickets and a set of special luggage tags. When it is time for your trip place one luggage tag on each piece of luggage and check them at the airport like you would normally do. You do not need to tell the airline that you are going to Disney World or give them any special information. When you arrive at the Orlando Airport (MCO), follow the directions in the booklet to the B side of the main terminal on Level 1. There you will find a Disney Magical Express Counter. Give them your booklet and they will pull up your reservation. You will then proceed to the bus line and be told which bus to board. The bus will then take you to your resort. In route it will play an informational video about Walt Disney World and Magical Express. Check in to your resort. Go off to the parks or whatever you choose to do. In a couple of hours the bags that you checked will magically be delivered to your room. (You do not need to be there!). It's just that easy! No stress, no visiting the baggage claim area, no lugging bags around the resort, and no need to tip anyone! It all happens behinds the scenes magically. The day before you depart, you will receive an envelope delivered to your room that tells you the information you need to return to the airport. Usually your bus will depart 3 hours before your plane is scheduled to take off. When you are ready to return home, depending upon the airline you may be able to get your boarding passes at your resort before you leave. Before the airline added these "checked bag fees" Disney would even check your bags at the resort, so you wouldn't have to handle them any further. Now in most cases you will have to claim your bag after your bus arrives at the airport and check it the old fashioned way and pay any necessary fees. The Bottom Line is that this is a great FREE service that Disney World offers and it really makes a difference when you are trying to keep to a budget. You if you haven't tried it yet, make sure that you do. 2 comments to "Save Money By Using the Magical Express on Your Next Disney World Vacation"
Any options that ease the stress are worth considering. If the magic Express can help tourists to have a more enjoyable vacation, that would make a worthy addition to Disney's offerings. I hope that with time some of these themes parks can lower their prices. That is one of the things that are preventing people from going when they want to. Do these buses run 24 hours a day? My flight arrives VERY early in the morning and I was wondering if I have to wait very long to get to the resort?